This is Qua-Fiki's first book, a collection of magic on a single theme. For the most part, these are former "packet" effects, which, when unified by the theme of "Go Fish Cards" can be performed in combinations from a deck of Go Fish cards rather than from separate packets. You can collect and make each effect by itself, and gradually build up your Go Fish card deck (including a trick box); or you can jump right in and buy the entire collection at one time, saving money in the process. Why Go Fish Cards? Because they make card magic appealing to audiences of children, while still being intriguing to teens and adults. 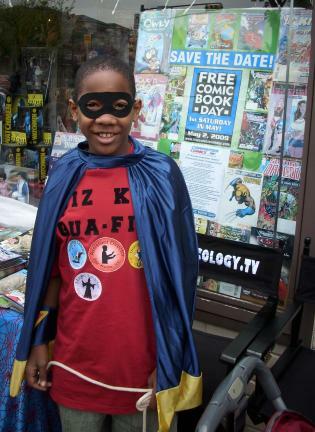 Qua-Fiki's second book is a collection of magic tricks that are all about super heroes. Kids of all ages identify with comic book, animated cartoon, and video game super heroes, but adults can enjoy the mystery and maghic as well. Qua-Fiki's first lessons in magic were not the usual coin and card tricks, but escapes...because that was his strongest interest. He has since discovered that performing escapes is a great way for a young teen age magician to convince adult audiences to take you seriously as a magician and performer, especially when you challenge a couple of big husky men to confine you with ropes or chains... and they can't do it! Even if you are not a teen-ager, escapes bring you respect (read about Houdini's experiences), but it's definitely for young men (or women) who are in good physical shape. This is a collection of Magic Story Books that uses a new effect invented by Qua-Fiki . This collection opens up the idea to many more uses. Each e-Book is complete and contains all the information and templates you need to make and perform with each storybook. It begins with some seasonal stories for Halloween, Christmas and Black History Month, but also includes general topics like Circus Capers, Baby Animals, and more. Go Fish Card Tricks - in Print! Go Fish Card Tricks is now available as a fully printed paperback from Lulu.com: 226 pages, 8.5" x 11", perfect binding, full-color interior ink - $75.00 plus shipping.